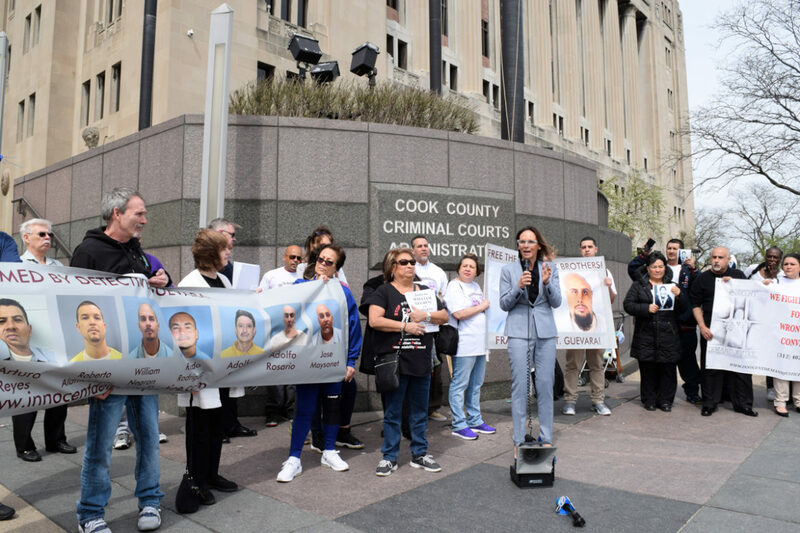 “We are here to bring everyone home,” says Jennifer Bonjean, an attorney who represents several men who were allegedly framed by retired Chicago police detective Reynaldo Guevara, prior to an evidentiary hearing at the Cook County Criminal Courthouse on April 10, 2017. In a bizarre twist in the long saga of a Chicago detective who allegedly framed dozens of Latino men for murder, Cook County prosecutors are now said to be considering immunity for retired gang crimes unit Det. Reynaldo Guevara. The latest development comes as new State’s Attorney Kim Foxx wrestles with how to handle a number of Guevara-linked appeals that are in the pipeline – and it may reflect confusion on her part regarding how to proceed. To attorneys for some of the men Guevara allegedly framed, it’s unclear how giving him immunity would add to the credibility of the prosecution. Guevera was most recently in the news when two more men who said he framed them had their decades-old murder convictions overturned. Prosecutors agreed to drop charges against Roberto Almodovar and William Negron, but only after arguing strenuously in court to defend their convictions – and then offering to free Almodovar if he would plead guilty, an offer he refused. Days later, another exonerated man sued Guevara, several of his fellow officers, and two former prosecutors, including a current Cook County judge. Prior to these developments, at a March 21 court date in yet another case, prosecutors said they were considering granting immunity to Guevara and compelling him to testify in order to defend the murder convictions of Arturo Reyes and Gabriel Solache, according to new filings by attorneys for the two men. The state’s attorney’s office declined to comment on the case. After years of court battles, Reyes and Solache last year won a hearing on their motion to suppress their confessions – which they say Guevara beat out of them ­– in a 1998 double murder. Two small children were abducted after their parents were brutally stabbed to death in that crime. Reyes and Solache saw photos of the missing children on TV news and recognized them as the infant and three-year-old recently brought home by the woman from whom they were renting rooms. That woman was Adriana Mejia, who was also convicted of the murders, after the blood of one victim was found on her shoes. Accompanied by Mejia’s husband, the two men brought the three-year-old boy to a police station. They were held for questioning and then transferred to Area 5 headquarters, where Guevara interrogated them, Solache for over 24 hours, Reyes for two days. The two men say Guevara continued to beat them until they agreed to confess. They signed statements in English that were dictated to assistant state’s attorneys by Guevara and another Spanish-speaking officer, though neither of the men knew English. 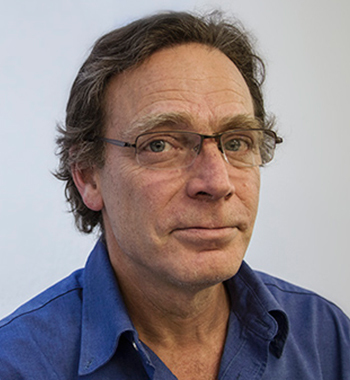 Reyes’ and Solache’s post-conviction case is significant because it was the first in which defense attorneys, led by the late Jane Raley of Northwestern University’s Center on Wrongful Convictions, argued that a long record showed that Guevara had a pattern and practice of coercing confessions and eyewitness identifications. That argument convinced an appeals court to reinstate their petition to suppress their confessions. When it came time for Guevara to give a deposition, he took the Fifth Amendment repeatedly. That left Reyes’ and Solache’s claims of coercion unrebutted, which convinced Judge James Obbish to grant them a hearing on their petitions. Then-State’s Attorney Anita Alvarez vowed to appeal Obbish’s ruling. But after Foxx was elected, she dropped the appeal, allowing a hearing. At the March court date, however, prosecutors said they planned to continue fighting the two men’s claims of coercion. Last week, attorneys for Reyes and Solache filed discovery motions asking prosecutors to disclose the type of immunity being offered Guevara, the terms of any immunity agreement, and copies of any written proffer or immunity agreement. They are also asking for copies of DNA tests on a knife found beneath one of the murder victims – which wasn’t tested until last year – and which reportedly revealed DNA from an unknown person, while excluding Reyes and Solache. This is “potentially exculpatory” evidence, attorneys say. As in so many of Guevara’s questionable cases, no physical evidence has ever been found linking Reyes and Solache to the crime. The two men had never been arrested before they walked into the police station in 1998. Prosecutors could respond to the discovery motions at a court hearing Thursday. Meanwhile, the lawsuit filed by Armando Serrano names Guevara, his partner Ernest Halvorsen, and retired Sgt. Edward Mingey, along with former assistant state’s attorneys Matthew Coghlan – now a Cook County judge – and John Dillon. The suit accuses them of conspiring to fabricate evidence and “maliciously prosecute” Serrano and his co-defendant Jose Montanez. Serrano and Montanez served 23 years in prison before their murder convictions were vacated last summer. A key member of that “band,” Bonjean said, was Joseph Miedzianowski, once tagged Chicago’s “most corrupt cop” and now serving a life sentence for racketeering and drug conspiracy. Wiretaps and witnesses in court have linked Guevara and Miedzianowski, she said. In one case, the two were scheming to frame a lower-level drug operator in order to pressure a big dealer to cut Miedzianowski in on the action. I suppose prosecutors could immunize Guevara if they were trying to get information on a larger conspiracy, although my guess is that Guevara’s many victims – and their many family members, who have persevered over decades in their quest for justice – would object loudly. It would be hard to argue that justice was being served. But that’s not what prosecutors are doing. Instead, they seem to be considering clearing the record of a cop who sent scores of innocent men to prison, in a bewildering attempt to keep two of those men behind bars. As more murder cases connected to former detective Reynaldo Guevara get overturned, the state’s attorney’s office still stands by his police work. Retired detective Reynaldo Guevara now faces allegations that he ran an extortion scheme in addition to framing Latino men for a series of murders in Chicago.